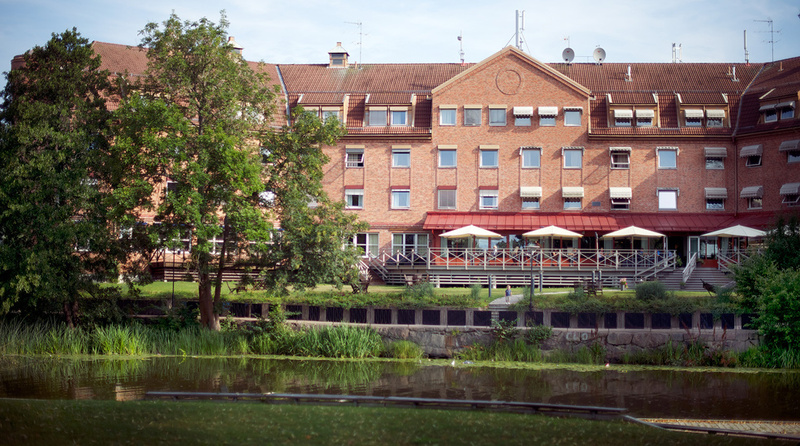 The Clarion Collection Hotel Kompaniet is located right next to the beautiful Nyköping river. The hotel has a gym and conference facilities. Breakfast, Afternoon Sweets and our Evening Meal are included in the room rate. This is a cash-free hotel. At the Clarion Collection Hotel Kompaniet you stay centrally, right in the heart of Nyköping's artisan history. Breakfast, Afternoon Sweets and an Evening Meal are included in the price of your room every day. The Clarion Collection Hotel Kompaniet is beautifully located in central Nyköping, right by the Nyköpingsån river. Stockholm Skavsta Airport is only 15 minutes away by car. The hotel's outdoor terrace is known as one of the best places to enjoy an alfresco drink in Nyköping, and you'll be just a short walk away from the city's other restaurants and cafés. The city's main attractions, including Nyköpingshus, Nyköpings Harbour, Rosvalla Eventcenter and Sörmlands Museum are also within easy reach. We serve a delicious buffet breakfast every morning and this is of course included in the price of your room. All our guests can also enjoy our daily Afternoon Sweets, as well as our Evening Meal here at the hotel. Read more about this under Services. The hotel also has a lobby bar where you can enjoy a glass of your favourite tipple! The hotel has a long and interesting history. Its name is taken from the days when Nordiska Kompaniet had its furniture workshop in the building. Some of the world's most exquisite furniture was made here – starting in 1904 and continuing for seventy years – and customers included celebrities, emperors and kings of the time. Today the hotel is adorned with several paintings, drawings and models from that era. Our relaxation corner has a sauna and jacuzzi, plus an area for relaxation. Nyköping has a thriving golf scene. We work together with two local golf courses, where guests at our hotel get a reduced package price including mid-afternoon snack, evening meal, breakfast and green fee. 15 minutes drive away from the hotel is Nyköping Golf Club/Ärila, a facility with a 36-hole course. 20 minutes away is Jönåker's Golf Club with its 18-hole course. The Clarion Collection Hotel Kompaniet is cash-free, which ensures added security for our guests and visitors. More information about this can be found under FAQs. Bus to Nyköping central station. Train to Nyköping central station. Bus number 515 from Skavsta to Nyköping bus station. phone +46 155 21 75 00.